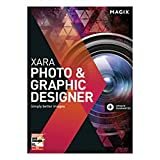 MAGIX/Xara Photo and Graphic Designer is a vector drawing and illustration software developed by Xara, which since 2007 has been a wholly owned subsiduary of MAGIX. Current versions of the software are only available for Microsoft Windows, although an open source version of the software (then under the title of "Xara Xtreme") compatible with Linux was released in 2006. Over the years, previous versions of the program have been released under a number of different names, mostly recently MAGIX Photo and Graphic Designer or Xara Photo and Graphic Designer, but in the past "Xara Xtreme" and "Xara X". As well as vector drawing, the software also incorporates tools for working with photo images such as cropping, red-eye removal, and so forth. The program also incorporates features for creating SWF flash animations. Internet connection: Required for registering and validating the program, as well as for some program features. Onetime registration required. The best of both worlds! 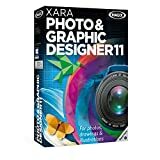 Xara Photo & Graphic Designer 11 combines universal image editing with high-performance graphic tools. The program also includes a wide range of professional design templates. Ideal for photography enthusiasts and creative individuals. Whether for quick image optimization or finely detailed photo retouching, this program offers intuitive editing tools to help you get the most out of your photos. With the world's fastest vector graphic engine, taken directly from the professional software Xara Designer Pro, impressive graphics are only a few clicks away. Create amazing photo collages by combining photos and graphics. Self-made graphics are also ideal for letters, business cards and many other uses. Combining photos with graphics creates a whole new range of design possibilities. The best of both worlds! 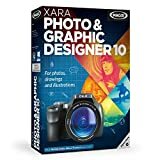 Xara Photo & Graphic Designer 10 combines universal image editing with high performance graphic tools. The program also includes a wide range of design templates. It's ideal for hobby photographers and anyone who likes to get creative. Whether for quick image optimization or finely detailed photo retouching. This program offers intuitive editing tools that can help everyone get the best out of their photos. With the world's fastest vector graphic engine taken directly from the professional software Xara Designer Pro impressive graphics are only a few clicks away. Create amazing photo collages by combining photos and graphics. Self designed graphics are perfect for adding a personal touch to letters, greetings cards and much more. The program's unique blend of photo editing and graphic design opens up a whole new world of creative possibilities. Take advantage of a high-performance program with a huge selection of photo and graphics tools for an unbeatable price. Work with all of the innovative features in real-time and check out how fast and effective this program is. Whether for editing photos or designing graphics, you can work on all sorts of different projects using only one program and export your creations in any way possible: as image files, web graphics, or PDFs for printing. The user-friendly concept and the extensive number of templates will allow you to dive into the world of graphic design fast and become familiar with just a single program instead of having to learn several photo editing and graphics software titles. It even supports Adobe Photoshop plug-ins . There's already a huge range of such plug-ins available, both free and commercial, for creating a variety of effects that would take a lifetime to explore. In addition the Live Effects tool, the most advanced of any available, enables you to apply these plug-ins to photos and vector shapes for a range of amazing visual effects. This program includes more than 40 built-in Live Effect plug-ins and offers support for a huge range of file formats, making it easy to exchange your work with other users and programs. This includes common bitmap types (e.g. GIF, JPEG, BMP, PNG, TIFF, PSD, and RAW photos) and key vector types (e.g. PDF and AI/EPS, SVG, and EMF/WMF). For text Xara Designer supports RTF (Rich Text Format) and for websites HTML and Flash. You'll also be able to import and export Adobe Photoshop PSD files including layer support. Whether novice or professional, this program is suitable for any creative mind who wants to see their ideas come to live. Discover the next generation of creative software with Photo & Graphic Designer 7. It is the all-in-one solution for image editing, illustration and desktop publishing (DTP) combining an intuitive user interface with a range of innovative real-time tools. It comes with over 500 individually customizable templates for photo albums, calendars, invitations, brochures, greetings cards, vouchers, flyers, certificates, business cards, CD covers & labels, letterheads, picture frames, poetry albums, or wedding scrapbooks. Its performance, universal application possibilities, and flexible handling make it the perfect tool for every photo enthusiast. 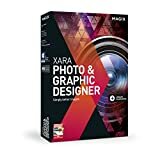 In addition to all standard image file formats, Xara Photo & Graphic Designer 7 supports over 130 new raw formats (RAW) of all current camera models (over 400 RAW formats in total). Edit different projects conveniently by using only one program and export them for different purposes: as image files, PDF files, in printed form, etc. Intelligent photo retouching will help you to remove unwanted objects and automatically replace them with pixel samples from the same photo creating impeccable results. Easily create animations and embed them in websites as Flash videos (.swf) or animated GIF graphics (.gif) which are perfect for interactive banner ads or special headings. Add graphics, photos, texts, flowing transitions between individual image elements (automatic "morphing") and interactive buttons and links. You can even export animations and standard photos, texts and artworks as video files (.avi). There is almost nothing this program cannot do with your images. The image editing program Photo & Graphic Designer brings together the best tools from universal editing and unique graphic design to revolutionize your workflow. With compelling features and maximum productivity, you get everything you need to achieve even better results. From fast optimization to comprehensive correction and retouching, this graphics software offers everything for professional photo editing. You can also create impressive vector graphics quickly and precisely, from logos, symbols and sketches to illustrations for print and web. The Online Content Catalog* contains a large collection of stock photos, graphics, effects and photo filters that are available to you for free use. Make each and every one of your projects a reality – there's no limit to your creativity! Photo & Graphic Designer brings together the best tools from universal editing and graphic design to revolutionize your workflow. From fast optimization to comprehensive correction and retouching, this software offers everything for professional photo editing. You can also create impressive vector graphics quickly and precisely, from typography, logos, symbols and sketches to illustrations for print and web. The Online Content Catalog gives you access to a massive selection of stock photos, graphics, effects and photo filters. Make each and every one of your projects a reality––there's no limit to your creativity! The best of both worlds! 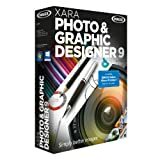 Xara Photo & Graphic Designer 11 combines universal image editing with highperformance graphic tools. The program also includes a wide range of professional design templates. Ideal for photography enthusiasts and creative individuals. Whether for quick image optimization or finely detailed photo retouching, this program offers intuitive editing tools to help you get the most out of your photos. With the world's fastest vector graphic engine, taken directly from the professional software Xara Designer Pro, impressive graphics are only a few clicks away. Create amazing photo collages by combining photos and graphics. Selfmade graphics are also ideal for letters, business cards and many other uses. Combining photos with graphics creates a whole new range of design possibilities.